The first strikes destroyed Cleveland, Tunis, and parts of Alaska, Canada, and Australia. That was barely the beginning. The swarm-- a cloud of meteors and asteroids 50,000 miles across--was coming. Hundred of missiles put Earth under siege forcing the world in a panicked hell of anarchy and catastrophe. Riots and orgies rampaged in the rubble. And worse waited. 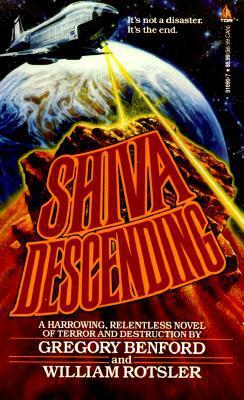 Because at the swarm's heart was Shiva--a 30 billion-ton comet set to hit earth with the force of 250,000 H-bombs. The impact would turn seas into vapor and mountains into dust. pray, scream, get drunk, or run amok--but no one could escape it. No one could survive it. And no one could stop it.